Discussion in 'Bug Reports/Issues' started by AndroZeus, Apr 11, 2019. In Mineworld, but it's not because of the coordinates that this is happening. Internal Exception: java.io.IOException: An existing connection was forcibly closed by the remote host. Game restart and computer restart already attempted. I have been kicked and getting this message too for some days now. Yesterday was in /explore, but sometimes it happens in the market. After that, all my login attempts end up in that eternal "loading terrain" screen. I made a lot of tests, with/without optifine, disabling all animations, the resource pack, lowering my graphics configurations, etc, without positive results. Also tested my connection and it was ok.
AndroZeus, I installed the april updated of Java and managed to log in in NC (I was in explore). Went to the market without problems, too. Maybe you should try the update thing. Just a little initial update while we poke a stick at this: I think it's possible our host isn't actually recognizing that you're logged out/logged in correctly. We had been running into this since the beginning of this iteration of the server on the back end, but didn't realize it was affecting gameplay for anyone, or much of anything beyond sending us a grumpy message when someone appeared to log in twice. We will look into it more vigorously and let you know what we find! Go to fast.com and screenshot the full results. This lets us check internet speed. You may need to click Show More Info and let it test for a few more seconds to get the full results. How are you connecting to the internet? i.e. ethernet cable vs wifi? Have you made sure that Java is permitted through both your computer firewall and any router firewalls? Java can be extremely finicky when faced with any sort of barrier. Have you tried re-installing MC? Do this one last for testing purposes. Let us know what you find so we can keep digging! The problem is clientside. I tested that by trying to play on a different server, where it happened as well, in the same time frame. It's not so consistent, but these are the lowest and highest I got. 2. WiFi, router in my house. 3. Java is allowed through. Currently trying a fix I found on Youtube (flush DNS, restart router, restart pc) and we're at eight minutes as I post this reply. Another update: I tried reinstalling, also didn't work. 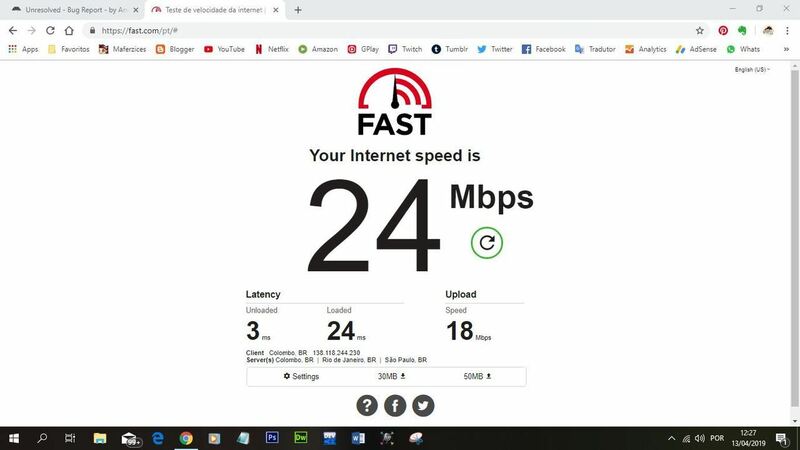 I noticed this time that my internet connection was gone when I was kicked. I'm beginning to suspect this is a router problem and that the router needs replacing. Here is my result. I'm using wi-fi. My java is allowed, and I re-installed the MC twice and still got the error after that. Most of my disconnections happens at night, so I'm going to test the connection again at night to see if something change. I haven't done anything since yesterday, but I don't have the problem today.